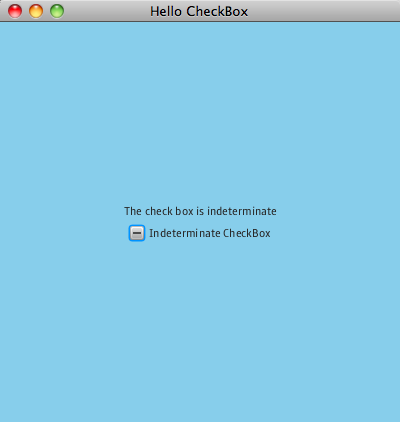 The CheckBox in JavaFX can be configured for two states (selected, or not) or three states (selected, unselected, or indeterminate). This indeterminate state is often useful when a checkbox is being used in a TreeView, for example. You might be implementing a tree view showing which features are installed, and need to toggle to an indeterminate state for the branch of some of the children are selected, and some are not. So, whenever either the indeterminate or selected property changes, we update the label’s text to match. This is kind of gross though (now that I’ve typed it out), because I have to attach a listener to two different properties. It would be nicer if there were a proper event handler that I could attach to the CheckBox which would be notified whenever indeterminate or selected changed. I’ve filed a JIRA RT-13992 to track this. Meanwhile, I can also use the high level binding APIs to do this. Here is an alternative implementation. then("The check box is indeterminate"). then("The check box is selected"). And that’s pretty darn slick, IMHO. It certainly is good to see indeterminate is supported in the core (unlike JCheckBox). But coming from a business model background I see need to write a wrapper on top of it, because in the business model the indeterminate state is not something separate from the actual value; a boolean itself can have three values: true, false and null. So binding the checkbox to a business model directly is not possible with the current implementation in JFX; we need to introduce a virtual Boolean (capital is intentional) property that deligates to selected and indeterminate. For JCheckBox I chose to extend it and add the logic directly on top, not the conceptually best solution, but a very practical one. And it works great. If you like, file a JIRA with an API suggestion! Giving meaning to null Booleans is the same as saying that a null Integer is MAX_INT + 1 or even worse saying that a null String is the same as the empty string. Please do not do this in API code. I would have to agree with tbee, the current API isn’t good. Both would throw RuntimeException if the check is set to not support indeterminate. which only returns true for State.SELECTED. And please don’t make the enum a part of CheckBox, it looks ugly and doesn’t save a file anyway. Or did you go “no API changes” before you released to public? Nice move if so. – how do I know if my program does use prism rather than java 2D for rendering (is there a simple test)? – is that a goal for the GA to optimize it in such a way that it (out? )performs at least to the level of the JTable? – if I was using prism, will the TableView then compete with the JTable? However, I just recently applied a number of performance improvements to TableView that have not yet been put out into a public build. These were based on Jira issues I received and considerably improve performance in a few common cases. It would be great if you could please file a Jira issue and attach a test application I can use to easily reproduce your issue. If you do this I will hopefully reply with the good news that the performance has already improved….and if not then I have something else to work on :-). If you file it against Runtime and set the component to ‘Control’ the bug will end up assigned to me. Hi Jonathan, thanks for your answer. I suppose I am using java 2D. even though, I would argue that even in Java 2D, javafx should be able to perform as well as Swing. I read that the JFXtras/XTableView (at the time) did “heavy use of node caching and other scene graph optimizations to ensure that operations do not degrade with the size of the data”. Is the TableView using the same kind of tricks? Yes, TableView does the same kind of tricks – in fact, it’s likely XTableView from JFXtras used the same approach that was previously used in ListView in JavaFX 1.3. For JavaFX 2.0, we use the same implementation across TreeView/ListView/TableView – we only create a very, very small number of ‘cells’ in these controls – just enough to show on screen (and maybe one or two more). As you scroll these controls, these cells are reused. My guess is that the performance issues are related to the number of columns you’re testing with. This will need to be investigated further to ensure good performance. Thanks to you and your colleague for the bug report – I’ll be looking into it in the comming weeks. I have been trying out the table view, but the recent build changes have affected my code and the previous code base is erroneous now. The cell values are just not able to render themselves. FYI, I read values out of a resultset. Can you please check my code and help me figure out the problem ? I would recommend visiting the OTN forums for JavaFX.